This article accompanies the first joint meeting of the Congressional and Knesset Israel Victory caucuses. Lt. Hiroo Onoda, sword in hand, walks out of the jungle on Lubang Island on March 11, 1974, almost 29 years after the Japanese surrender. In 1974, Second Lt. Hiroo Onoda of the Imperial Japanese Army was still fighting for his emperor, hiding in a Philippine jungle. He had rejected many attempts to inform him of Japan's surrender 29 years earlier. During those long years, he senselessly murdered about one Filipino and injured three others per year. Only a concerted effort by his former commander finally convinced Onoda that the emperor had accepted defeat in 1945 and therefore he too must lay down arms. The Palestinians of the West Bank and Gaza are Onoda writ large. They formally acknowledged defeat by Israel 24 years ago, when Yasir Arafat stood on the White House lawn and recognized "the right of the State of Israel to exist in peace and security." Trouble was, Arafat himself did not sincerely offer this act of surrender and most Palestinians rejected it. Accordingly, the war continues, with Palestinians emulating that grizzled, vicious Japanese soldier: they too battle on for a failed cause, murder senselessly, and ignore repeated calls to surrender. Just as Onoda insisted on believing in a divine emperor, Palestinians inhabit a fantasy world in which, for example, Jesus was a Palestinian, Jerusalem was always exclusively Islamic, and Israel is the new Crusader state on the verge of collapse. 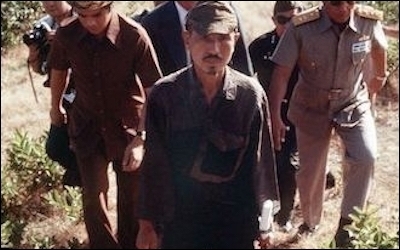 The Palestinians of the West Bank and Gaza are Hiroo Onoda writ large. In this spirit, Iranian dictator Ali Khamene'i has helpfully provided the precise date of Sep. 9, 2040, when Israel will vaporize, and his acolytes built a large doomsday clock to count down the days. Some imagine Israel already gone, with nearly every Arabic map of "Palestine" showing it replacing the Jewish state. 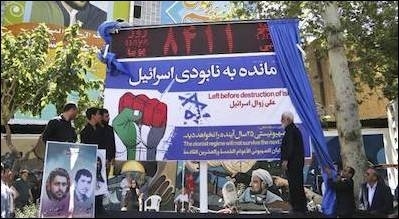 Iran's doomsday clock, counting down to Israel's destruction. First, Islam carries the expectation that a land once under Muslim control (Dar al-Islam) is an endowment (waqf) that inevitably must revert to Muslim rule. Bernard Lewis notes that Muslims historically responded to the loss of territories in Europe with the expectation that these were "Islamic lands, wrongfully taken from Islam and destined ultimately to be restored." This assumption of righteousness and inevitability has abiding power as shown by such aggressions as Turkey's in Cyprus and Syria's in Lebanon. Jerusalem especially arouses intense Islamic sentiments. First exploited at a pan-Islamic conference in 1931 hosted by the mufti of Jerusalem, Amin al-Husseini, many others since then – including Yasir Arafat, Ayatollah Khomeini, and Recep Tayyip Erdoğan – have picked up this rallying cry. July's Temple Mount fracas over metal detectors revealed the city's atavistic power, prompting such varied powers as Muslim Brotherhood theorist Yusuf al-Qaradawi, Jordan's monarch, the Arab League, and the Organization of Islamic Cooperation loudly to support the Palestinian position, no questions asked, as though it were still the 1950s with its shriek of unthinking rhetoric. Palestinian delusion results from a toxic mix of Islamic doctrine, international succor & Israeli timidity. Second, assorted governments, Leftists, do-gooders, and other internationals encourage Palestinians to sustain the reverie of victory through a combination of obsessive anti-Zionism and the pretense that a "Palestine" exists. Athletes have represented the sham state of "Palestine" at the Olympics since 1996. Israel maintains diplomatic missions in just 78 countries compared to 95 for the Palestinian Authority. With a solitary exception in 2013, every critical UNESCO country-specific resolution in recent years has focused on Israel. This international support encourages Palestinian delusion. Third, despite recent polling that shows how a large majority of Israelis want to push Palestinians into recognizing that the conflict is over and Israel won, no Israeli government since 1993 has taken such steps. Why this persistent discrepancy? Because Israel's security services, which usually have the last word on policy, resist any steps that could possibly provoke Palestinian violence. "Things now are about as good as possible," they imply, "so please stay away with any hare-brained ideas about our getting tougher." 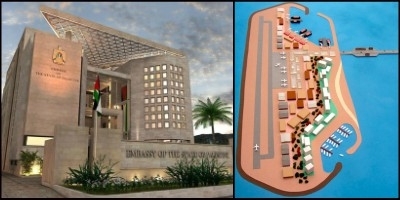 Left: The resplendent embassy of the "State of Palestine" in Islamabad, Pakistan. Israeli minister of intelligence Israel Katz's would-be island off Gaza. This reluctance explains why Jerusalem tolerates massive illegal housing, releases murderers from prison, provides water and electricity to Palestinians at advantageous terms, and urges international donors not just to subsidize the Palestinian Authority but to fund mega-projects of Israeli devising (such as an artificial island off Gaza). Contrarily, Israel's wizened security types nix any initiative that deprives the Palestinians of funds, punishes them more severely, or infringes on their existing prerogatives (such as control of the Temple Mount). Palestinian delusion results, then, from a toxic mix of Islamic doctrine, international succor, and Israeli timidity.